Originally the Almshouses in Wells were separate unincorporated trusts. In 2004 these charities were brought together and the five almshouses became one charity - the City of Wells Almshouses Trust. Wells Almshouses came to Cosmic needing a new website, specifically developed as a content management system so that they could quickly and easily make changes to the website. Function-wise, the website comes with a protected area for residents so that they can access files and information not available to the general public, as well as a gallery filled with beautiful photos, latest news articles, upcoming events, job vacancies and more. 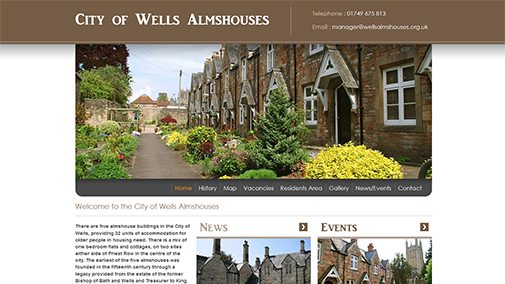 This was all created with a content management system, meaning the City of Wells Almshouses team can log in to the website and easily make content changes without having to request a developer make the changes for them. Take a look at the website at wellsalmshouses.org.uk and tell us what you think.